The most recent Battle of Alberta was a throwback affair between the Edmonton Oilers and Calgary Flames. There were hits, saves, fights, and a goal; but those highlights weren’t the only things that caught my attention. Oilers colorman Bob Stauffer sent a tweet out that perked my ears immediately. After I’d read that tweet I tried to think if I’d read or heard any recent rumors connecting the Bruins and Oilers and I couldn’t think of anything. Last summer there were some rumblings that Oscar Klefbom might get moved for Torey Krug. The Hockey Writers’ Alex Thomas and Brandon Share-Cohen have written pieces on what they think the Bruins should do here and here. Who Was Sweeney Watching Then? Boston is 5-4-1 in their last ten games and they are only six points up on their nearest wildcard spot threat, the Detroit Red Wings. Some key vets are starting to run into injury problems, though. Zdeno Chara (MCL), Patrice Bergeron (ribs), Kevan Miller (larynx) are all out with injuries. 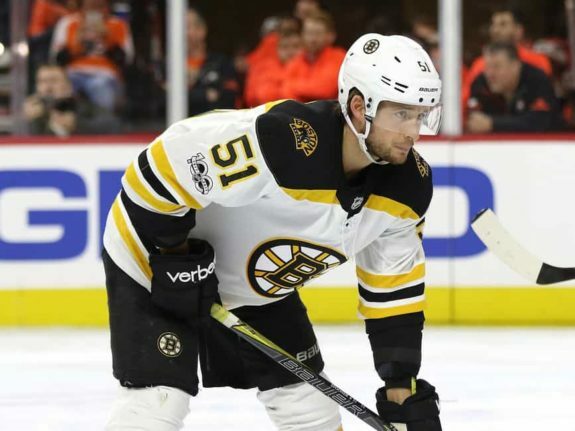 Winger Jake DeBrusk is day-to-day after taking a puck to the head vs. Toronto and Urho Vaakanainan is recovering from a concussion. As reported in the Nov. 27th edition of 31 Thoughts, Sweeney is looking for help up front. It’s my belief that Sweeney might’ve been watching either Ryan Spooner or Milan Lucic. Two former Bruins who had previous success with the organization. As a Bruin, Spooner amassed 142 points in 253 games. If there’s any organization that knows more about the Ottawa native than his current GM Peter Chiarelli, it’s Don Sweeney and the Bruins. Stauffer recently said on his radio show that he wasn’t sure if Spooner was originally acquired by the Oilers to be a fourth line center (or a third line one depending on how you view his usage under Ken Hitchcock) and wondered if there weren’t a couple more moves coming. Boston has Colby Cave as their second line center right now, Sean Kuraly centering their third line, and Jakob Forsbacka Karlsson manning the draws on their fourth line. That combined with the sentiment from Stauffer and Sweeney showing up for an Oilers game in December has me thinking that something is up. Lucic has fallen on hard times the last couple of seasons in Edmonton. He hasn’t scored a goal in North America yet this year and for every game he goes without a goal or an assist, the pressure mounts. Maybe a change of scenery is something that will unlock his scoring ability. Back in June, Jason Gregor reported that Lucic was “open to a trade” and that set ablaze the Oilers Twittersphere. Most feel like his contract is an anchor on this team. Personally, I feel like the Vancouver native is playing great hockey, but the puck simply isn’t going in the net. He might own the worst puck luck in the history of the NHL. The Identity Line reminds me of the Bruins fourth line from their Stanley Cup victory in 2011. That line featured Dan Paille, Shawn Thornton, and Gregory Campbell. They were an integral part of Boston’s championship run and I’m thinking if Edmonton is going to make a run this year, they should try to keep that line together. That being said, Jujhar Khaira would slot in just fine if Edmonton were to move Lucic. Boston’s cap situation isn’t as dire as Edmonton’s — they have just over $2.5 million available. Whereas Edmonton only has $50,000, meaning the Oilers can’t take on any more salary or else they risk running into problems once Andrej Sekera comes back from the IR in two to three weeks. I had it suggested to me that a Lucic-for-David Backes trade would make a lot of sense for both teams. The reasoning for that was that Backes has one less year left on his $6 million contract and he thrived under Hitchcock in St. Louis. Could the Bruins use some more physicality in their lineup? Toronto roughed them up something fierce the other night and had guys like Matt Grzelcyk and Chris Wagner trying to send messages. The fact that Lucic is a cult hero in Boston and known for his ability to let the other team know if they’ve crossed the line or not doesn’t hurt. What does hurt that suggestion is Backes’ no-movement clause, though. There are definitely some advantages in that aspect. I like Backes, but has he ever slowed down. He’s 34-years-old now and he’s a shadow of the player he used to be. As for Spooner, what if the Bruins offered Danton Heinen for him? Spooner is making $3.1 million a year and if we minus Heinen’s $872,000 from that, Boston would still be cap compliant. Heinen had 47 points for Boston last season, but his production is way down this year, with only seven points in 27 games. 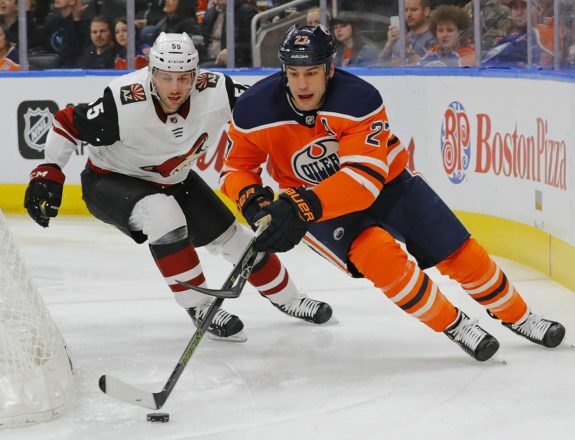 At the end of the day, Spooner and/or Lucic going to Boston would probably make a lot of Oilers fans happy, but for me, I’m torn on seeing them go. I love what The Identity Line is doing for the Oilers and Lucic is an important part of that. 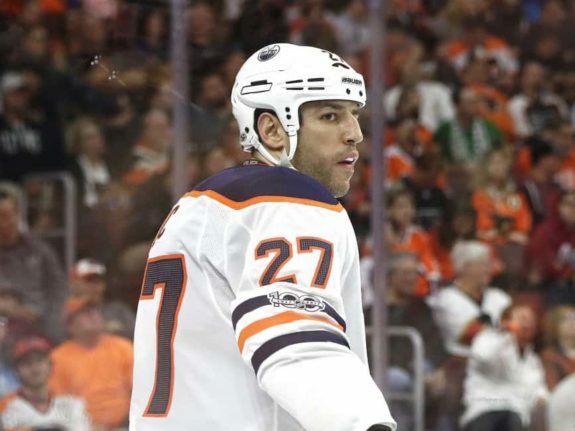 I really feel like if the Oilers make the playoffs, they’re going to need players like Lucic who have a lot of experience with the post-season to help guide the way. With Spooner, I see flashes of a player there, but as Bob Stauffer pontificated, was he really acquired to be a fourth line center?